CBI - China: Day 138 of 142 of the 1st Battle of Hebei. Spain: Day 306 of 985 of the Spanish Civil War. Spain: Day 671 of 985 of the Spanish Civil War. CBI - China: Day 316 of 2,987 of the 2nd Sino-Japanese War. Day 101 of 124 of the Battle of Henan. CBI - China: Day 681 of 2,987 of the 2nd Sino-Japanese War. Day 29 of 35 of the Battle of Suizao. CBI - Mongolia: Day 8 of 129 of the Battle of Khalkhin Gol, a border dispute between the Soviet Union and Japan. Atlantic: The HMS EFFINGHAM is scuttled after suffering serious damages incurred yesterday after striking the Faksen Shoal off Norway. ETO - Norway: Day 40 of 63 of the Battle of Norway. ETO - Belgium: Day 9 of 19 of the Battle of Belgium. German troops capture Antwerp. Meanwhile the German government re-incorporates into its borders the territory that Germany was force to cede to Belgium in the Treaty of Versailles. ETO - France: Day 9 of 44 of the Battle of France. Rommel's German 7th Panzer "Ghost" Division reaches Cambrai, en route to the Channel coast. The German 19th Panzer Korps captures Petonne and Amiens. CBI - China: Day 1,047 of 2,987 of the 2nd Sino-Japanese War. Day 186 of 381 of the Battle of South Guangxi. Day 18 of 49 of the Battle of Yichang. Atlantic: German sub U-107 sinks the British ship PIAKO 130 miles west of Freetown, Sierra Leone, British West Africa. ETO - UK: Day 255 of 258 of the Blitz. ETO - Germany: British RAF air raids on Germany continue. MTO - Yugoslavia: Italy annexes the Yugoslavian territory of Dalmatia. MTO - Libya: Day 39 of 256 of the Siege of Tobruk. Middle East: Day 17 of 30 of the Anglo-Iraqi War in Iraq. RAF planes from Habbaniya bomb Iraqi positions in Falluja throughout the day. Meanwhile, Arab troops loyal to Britain relieve the besieged RAF Habbaniyah airbase. East Africa: Day 343 of 537 of Italy's East African campaign in the lands south of Egypt. The British commander of the Indian 5th Division has lunch with the defeated Italian commander Duke of Aosta at Amba Alagi, Abyssinia. The Duke agrees to not destroy their guns and supplies and to dismantle or identify all their mines. CBI - China: Day 1,412 of 2,987 of the 2nd Sino-Japanese War. Day 12 of 21 of the Battle of South Shanxi. USA: New York City suspends night baseball games for rest of the war. USA: The New York Times publishes an article saying that the Germans have killed by machine gun 100,000 Jews in the Baltic states, 100,000 in Poland, and 200,000 in Russia. Atlantic: Day 125 of 169 of Germany's Second "Happy Time," during which U-boats sink 609 Allied ships with little risk. ETO - Germany: The RAF bombs targets at Mannheim. Russian Front - North: Day 253 of 872 of the Siege of Leningrad. Russian Front - North: Day 100 of 102 of the Battle of the Demyansk Pocket, another failed attempt to break the siege at Leningrad. Russian Front - North: Day 14 of 658 of the Siege of the Kholm Pocket. Russian Front - South: Day 7 of 17 of the 2nd Battle of Kharkov, Ukraine. Russian Front - South: Day 201 of 248 of the Siege of Sevastopol, Crimean Peninsula. Russian Front - South: Day 11 of 12 of the Battle of the Kerch Peninsula, Crimea. The Germans bring the Soviet advance to a halt. East Africa: Day 14 of 186 of the Battle of Madagascar. CBI - Burma: Day 156 of 164 of Japan's Invasion of Burma. Most of the retreating Allied troops of BURCORPS reach India. CBI - China: Day 1,777 of 2,987 of the 2nd Sino-Japanese War. Day 4 of 124 of Japan's Zhejiang-Jiangxi Campaign, launched to punish anyone suspected of aiding the Doolittle raiders in China. Roughly 250,000 Chinese will be killed. PTO - Malaya: Day 89 of 357 of the Battle of Timor Island. US 5th Air Force B-17s bomb shipping in Koepang Bay. Russian Front - North: Day 618 of 872 of the Siege of Leningrad. Russian Front - North: Day 379 of 658 of the Siege of the Kholm Pocket. MTO - Romania: The Papal Nuncio in Romania makes a request to the Romanian foreign minister to allow the immigration of 8,000 Jewish orphans in Transnistria to Palestine. MTO - Italy: US 12th Air Force RAF Wellingtons night bomb the Alghero-Sassari area in Sardinia. During the day, B-17s bomb at Trapani, Sicily. CBI - China: Day 2,142 of 2,987 of the 2nd Sino-Japanese War. Day 7 of 23 of the Battle of West Hubei. The Japanese launch a new offensive along the Yangtze river, 250 miles northeast of the Nationalist capital of Chunking. PTO - Alaska: Day 346 of 435 of the Battle of Kiska, Aleutian Islands. Day 8 of 20 of the Battle of Attu. US 11th Air Force provides air support. PTO - Marshall Islands: The USS POLLACK sinks the Japanese ship TERUSHIMA MARU. PTO - New Guinea: Day 27 of 148 of the 2nd Battle of Lae-Salamaua. US 5th and 13th Air Forces provide air support. Russian Front - North: Day 107 of 191 of the Battle of the Narva Isthmus, Estonia. Both German and Soviet troops remain in their defensive positions. Russian Front - South: Day 41 of 60 of the Battle of Romania, 1st Jassy Offensive. MTO: US 15th Air Force B-17s and B-24s bomb targets in Romania and Yugoslavia. MTO - Italy: Day 123 of 123 of the Battle of Monte Cassino. RAF and US Air Forces provide air support. Day 8 of 8 of Operation DIADEM. The Germans have abandoned the Gustov Line, setting up a new Hitler Line 30 miles to the south of Rome. Polish troops capture the town of Cassino. MTO - Italy: Day 118 of 136 of the Battle of Anzio. RAF and US Air Forces provide air support. CBI - Burma: Day 75 of 166 of the UK's Operation THURSDAY. CBI - Burma: Day 70 of 147 of the Battle of Myitkyina. US 10th Air Force provides air support. Merrill sends a Chinese unit to attack Myitkyina, but all goes wrong as two of the Chinese battalions mistakenly engage each other in a fierce fight. CBI - Burma: Day 48 of 302 of the Chinese Salween Offensive. CBI - China: Day 2,508 of 2,987 of the 2nd Sino-Japanese War. Day 32 of 39 of the Battle of Central Henan, the first offensive in Japan's Operation ICHI-GO. The USS PUFFER attacks a Japanese convoy in the South China Sea, sinking the freighter SHINRYU MARU. CBI - India: Day 72 of 118 of the Battle of Imphal-Kohima. Anglo-Indian troops attack the Japanese positions at Ninthoukgong. PTO - Alaska: US 11th Air Force B-24s and B-25s bomb and sink a couple of Japanese ships near the Kurile Islands. PTO - Marshall Islands: The US 7th Air Force bombs targets in the Maloelap Atoll. PTO - New Guinea: Day 80 of 80 of the Battle of the Admiralty Islands. This battle ends as a decisive Allied victory. PTO - New Guinea: Day 156 of 597 of the Battle of New Britain. US 13th Air Force provides air support. PTO - New Guinea: Day 27 of 481 of the Battle of Western New Guinea. PTO - Solomon Islands: Day 200 of 295 of the Battle of the Bougainville Islands. US 13th Air Force provides air support. 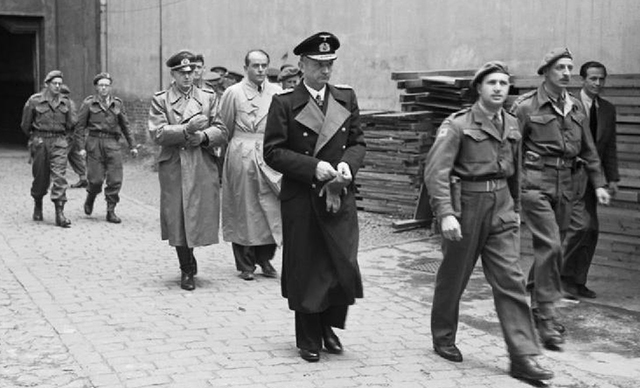 Germany: Admiral Dönitz, Hitler's successor, issues an order of the day to the Wehrmacht in which he expresses horror at revelations about the Nazi concentration camps, in an attempt to distance the surrendered German military from the atrocities committed by the Third Reich. 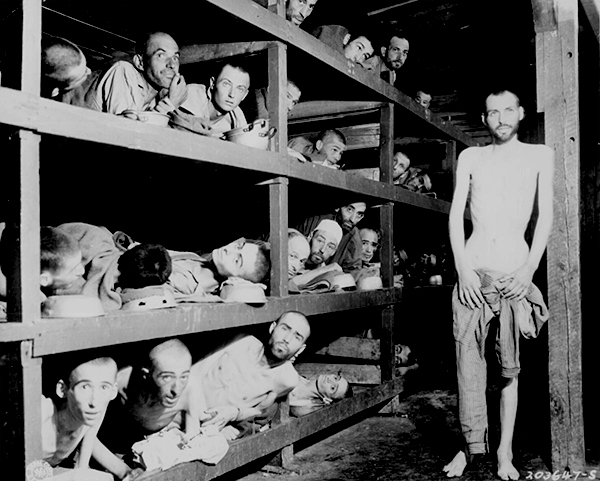 Inmates of the Buchenwald camp inside their barracks, an example of the cruelty of the living situations inflicted upon them by the Nazis. Buchenwald was a slave labor camp, not an extermination camp, but some 50,000 were worked to death there or died of malnutrition. CBI - China: Day 2,873 of 2,987 of the 2nd Sino-Japanese War. Day 48 of 91 of the Battle of Zhijiang. US 14th Air Force provides air support. Day 40 of 60 of the Battle of West Hunan (near Zhijiang). Japanese troops continue withdrawing from southern China. PTO - Alaska: US 11th Air Force bombs the naval harbor and airfield at Kataoka on Shimushu Island. PTO - Dutch East Indies: Day 18 of 52 of the Battle of Tarakan Island. PTO - Formosa: US 5th Air Force bombs the airfields at Taichu and Tainan. PTO - Japan: US 7th Air Force attacks with bombs, bullets and rockets on radar and ground installations on Kume Jima Island and Kyushu Island. PTO - Japan: Day 48 of 83 of the Battle of Okinawa. The destroyer USS LONGSHAW gets stuck on a reef and is sunk by a Japanese shore battery. PTO - New Guinea: Day 508 of 597 of the Battle of New Britain. US 10th Air Force provides air support. PTO - New Guinea: Day 392 of 481 of the Battle of Western New Guinea. US 10th Air Force provides air support. PTO - Philippines: Day 210 of 299 of the 2nd Battle of the Philippines, aka the Liberation of the Philippines or the Philippines Campaign. PTO - Philippines: Day 155 of 244 of the Battle of Luzon. 5th Air Force provides air support. PTO - Philippines: Day 70 of 159 of the Battle of Mindanao Island. 5th Air Force provides air support. PTO - Philippines: Day 62 of 135 of the Battle of the Visayas region. US 5th and 7th Air Forces provide air support.